This cute Pierson reborn kit will be available to buy soon via Truborns. Made in vinyl ny Cassia Robini Pimenta, the babies created from this kit will be so sweet. I love to see just how realistic artists can make the dolls they create. This kit sculpt has been made to encapture all the adorable details of a real baby. 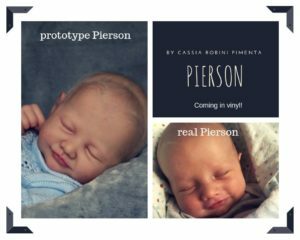 Which is why a finished baby from this Pierson reborn kit is so realistic. I currently do not have the details for this sweetie, other than it is coming soon in vinyl. But you know as soon as I do that I will give them to you. So if you like what you see so far, be sure to keep an eye out for the release of this little one. To check the stock availibity yourself, you can use the link provided below.